The Mid-County Wrestling Club is looking forward to our 2018-2019 season. Registration is now open! Click here for registration information. Make sure these important dates are on your calendar. OPEN HOUSE/INFORMATION MEETING: Tuesday, October 30th and Thursday, November 1st, 6:00-7:30pm: at Kirkwood High School between the Denver Miller Gym and the David Holley Assembly Hall. 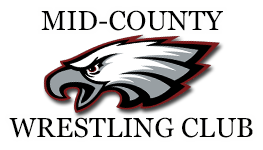 Mid-County is excited to invite all children ages 8-14 to become Eagles! All children ages 5-7 will begin as Little Eagles.